I gave myself a 1Q2019 target to write proper READMEs for my Github repos. First up is PasswordCrypt. I reproduce the README here. PasswordCrypt is a library for Pharo Smalltalk to handle passwords salted and hashed by SHA-256/SHA-512. Its primary components are PCPasswordCrypt, PCAuthenticator and PCBasicAuthenticator. The result is a string in modular crypt format (MFC). $5 on the left of the string indicates that the hashing algorithm is SHA-256. For SHA-512, the indicator is $6. PCAuthenticator builds on PCPasswordCrypt to provide username/password management. PCAuthenticator operates as a singleton object to persist its data in the Pharo image across restarts. "Initialize the authenticator for my application." "Create another user object and validate its password." "If the passwords match, userToValidate is returned; otherwise, nil is returned." it is feasible to use PCAuthenticatorUI for a small number of users, such as during development and testing. The generated shared library is libshacrypt.so on Linux and libshacrypt.dylib on OSX/macOS. It must be placed where the Pharo VM can find it at run time. My practice is to place the shared library file together with the Pharo VM's plugins. On macOS, suppose Pharo is installed in /Users/pierce/Pharo.app, then libshacrypt.dylib goes into /Users/pierce/Pharo.app/Contents/MacOS/Plugins/. Store/retrieve usernames/passwords in htpasswd files. Ulrich Depper's sha-crypt web page. I've just added RIPEMD160 to the EVP interface in OpenSSL-Pharo. This post serves as a HOWTO. handle := LcLibCrypto current apiEvpRIPEMD160. result := ByteArray readHexFrom: '9c1185a5c5e9fc54612808977ee8f548b2258d31' readStream. key := ByteArray readHexFrom: '0b0b0b0b0b0b0b0b0b0b0b0b0b0b0b0b0b0b0b0b' readStream. expectedResult := ByteArray readHexFrom: '24cb4bd67d20fc1a5d2ed7732dcc39377f0a5668' readStream. I've migrated OpenSSL-Pharo to Github. My near term goal is to wrap enough libcrypto functionality to implement the client-side of Let's Encrypt. I meant to put it up on GH, for the ease of forking and PRs, but I couldn't get Iceberg to work, and gitfiletree also failed to load, so STH it is for now. I've updated my SHA256/512 password hashing library to Pharo 5's FFI and moved it from SS3 to GH. In the GH repo, C source files are in the src-c directory. Compile with the Makefile there. Move the .so or .dylib file to where the VM can find it. Run the tests in TestRunner. Provided the Pharo VM can find the shared library, all 12 tests should pass. Currently PCAuthenticator hardcodes to SHA256. It should be straightforward to make the hashing algorithm pluggable, including from other shared libraries. Hosting on GH makes it easier for forks and PRs. I bought a Yubikey device and am going to write a Pharo library for it. Meanwhile, I discovered that Richard Prinz has an implementation of RFC 6536 Time-based One Time Passwords for Pharo. Recently, Adobe was hacked, resulting in, among other breakages, the loss of 130 million passwords. It was revealed that the passwords were encrypted using ECB, electronic cookbook mode, which is a rather poor way of securing passwords. The MacRumors forum site was also hacked recently. The site runs the vBulletin forumware, which protects passwords using md5crypt. md5crypt is a password hashing scheme devised by Poul-Henning Kamp in 1995. The hashed password takes the format $1$<salt>$<password-hash>. The hash is designed to be expensive to compute, to slow down attacks. In 2012, Poul-Henning announced that md5crypt was no longer considered safe, in view of advances in computing power. sha-crypt, from Ulrich Depper, is a public domain implementation of SHA-256/512-based password hashing, which works similarly to md5crypt, using SHA-256/512 and allowing an arbitrary number of rounds through the hashing algorithm. Move the .so or .dylib file to where your plugins are. PCPasswordCrypt sha256Crypt: 'Hello world!' withSalt: 'saltstring'. Tested on OSX (Mountain Lion) and Linux (Mint 14). The C programs work on FreeBSD, but my self-built FreeBSD Cog VM doesn't have NativeBoost. The C programs are found here. Once I figure out how, I'll put them on GitHub. PCPasswordCrypt is published on SqueakSource3. Perhaps fine for pedagogical material, and I do the same during development. However, I don't want that for production - hardcoding a database (or any) password in application code simply offends my sensibilities. Secret splitting divides a message into a number of pieces. In the simplest scheme, all the pieces are required to reconstruct the message. To split the message into, say, 5 pieces, generate 4 random strings, each of the same length as the message, then XOR the message and the random strings together. Save the random strings and the final XOR output. To reconstruct the message, XOR the 5 pieces of saved data. I've written a package called SpsSplitPasswordStore that implements the simple secret splitting scheme described above. The motivation is to avoid both hardcoding the database password in application code and saving the password in clear text in a file. The security claim I make for SpsSplitPasswordStore is that it is more secure than hardcoding your database username/password pair in your application code. While convenience usually trumps security in the real world, in this case, SpsSplitPasswordStore also makes it more convenient to change the application's database password without requiring changes to the application. The OWASP Zed Attack Proxy, also known as ZAP, "is an easy to use integrated penetration testing tool for finding vulnerabilities in web applications." ZAP fuzzes the search parameter. And finds something interesting: "200 OK" is expected, as is "404 Not Found". But "500 Internal Server Error" isn't! Aha! This is an SQLite error: "The database file is locked". Here is one possible StackOverflow explanation. I'll have to verify if that is indeed the cause. Through all this, the server kept running. Although attacks like "insert into mysql.user (u..." and "exec sp_addlogin 'name'..." returned "Successful", my backend is SQLite and these don't apply. Still, some time ago while doodling with SQLite, I manage to lock up an image such that it crashes instantly upon re-opening. I haven't found the reason. My conjecture is that it is related to my code's not doing FFI properly, although at this time I have no idea how to test this. I'll probably keep banging on the SQLite interface to see if it eventually kills the image. I've previously written about StackOverflow full text indexing using SQLite. I've now loaded this site's small body of content into an SQLite FTS database, and have implemented a search interface for it. Before opening up the search interface to the big bad Internet, I reckon some testing is required. 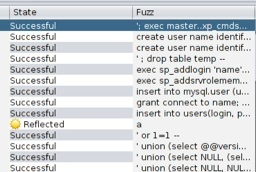 Fuzzing "is a black box software testing technique which basically consists of finding implementation bugs using malformed/semi-malformed data injection in an automated fashion." This site runs as a Zinc server delegate in Pharo Smalltalk. In fuzzing the search interface, I will be fuzzing Zinc's input handling, my server delegate's input handling including its susceptibility to SQL injection, and possibly the CogVM FFI that hooks Pharo up with SQLite. Of course, the Smalltalk image is not a black box. While fuzzing I will be able to view Zinc's source code, explore live objects, and check behaviour.